Cabinets are constructed of sturdy 18-gauge (1-mm) thick double-wall, welded steel with 1-1/2” (38-mm) of insulating air space for fire resistance. Manual-close door(s) opens to a full 180 degrees and self-latches when pushed closed. 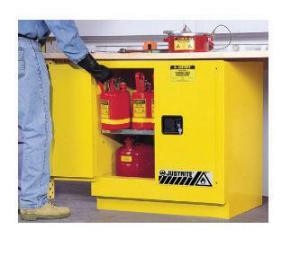 Self-close door(s) shuts and latches automatically when a fusible link melts at 165°F (74ºC) under fire conditions. Unique, concealed self-closing mechanism offers obstruction-free access to contents. All door styles meet OSHA and NFPA 30; self-close door styles also meet NFPA 1 and the International Fire Code. Caution: WARNING - This product can expose you to chemicals including lead, which is known to the State of California to cause cancer and birth defects or other reproductive harm. For more information go to www.P65Warnings.ca.gov.